I always say it’s important that if you want to get healthier and start losing weight, start with what you eat at home. Think about most of the meals you consume in a given week. Most of these meals are undoubtedly at home not out at restaurants or fast food places. The fact of the matter is that it not only saves money but if you are doing the cooking you can ensure how your food is cooked and the quality of what you are eating. For instance in my last blog post I talked about the importance of using coconut oil if you are sauteing food or heating up your food. Well the same is true with everything you get at your neighborhood grocery store. Well for one “cage free” means that the hens that lay the eggs are not kept in cages and free to roam. The hens are provided with sunlight, shade, shelter, an exercise area, fresh air, and are protected from predators. This is the new rage when it comes to eating healthy proteins these days. Especially when you’re in california you’ll start seeing red meat that is labeled like this as well. You’ll see something along the lines of raw grass fed cows. The reason why this is so important is that when you get a raw grass fed animals or cage free animals they are natural. They eat what they would in the wild. They are not eating grass or foods with pesticides or alternatives to try and enhance the animal. The same is true with whey protein. Take a look at this article over here I wrote on organic whey protein powder to see why it’s so important to add raw grass fed animals to your dieting. Ok before I go too far off a tangent you might be having a few more questions about the types of eggs to get like, “Does the color of the eggs matter?” Simply put: Nope. I’m sure you’ve seen white eggs or brown eggs, but that has nothing to do with the quality, flavor, nutritional value, or thickness of the eggshell. It really only has to do with the breed of hen that lays the egg. WARNING: There is one thing I’d like you to avoid and that is “Processed Eggs” like you would see with egg liquids or dried eggs whites. If you want to stay healthy avoid the word processed at all costs. Why Avoid these? Because it means they are not natural. They are altered in some form or another. 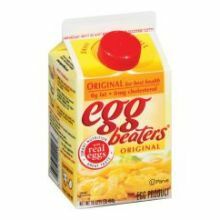 For instance, liquid eggs are shell eggs broken by special machines then pasteurized before being further processed and packaged in liquid, frozen or dried form. These Processed egg products may also contain preservatives and flavor or color additives which can be extremely unhealthy for you.